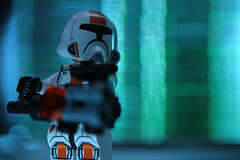 I’ve been using a stack of CD-R’s as the background for several images of Lego minifigures. 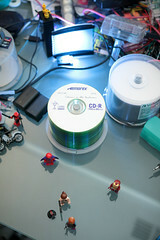 The CD-R’s are lit by flashlight (a silver Hexbright). In front of the flashlight is a color filter and a light scattering filter, both really intended to be used with a flash. The position of the CD-R’s and the two Star Wars minifigs in front are unchanged from the recent photo “Don’t let this happen to you”. The examples shown here all use the same color filter, but I also used violet and red-ish ones, as well as none at all. The background result is affected by the relative position and orientation of the flashlight, CD-R stack, and camera. This makes using a flash in place of the flashlight really difficult. Also, I usually had the Hexbright at a low brightness setting, so it really was flashing, but it bothered the camera more than me. All of these positions and orientations provide lots of variables to play with to make a number of interesting effects for colorful abstract out-of-focus backgrounds. Mom, I can see straight! Some of the light going through the CD-R’s makes nice vertical columns of highlights. There are four of these columns: one on either side of the central spindle pillar thingy (I don’t know what that is called), and two further away that seem to be reflections of the first two. Getting all four in the same picture is nearly impossible, but two is pretty easy and three isn’t difficult. Some prism-like effects are visible in those highlights, and the CD-R’s colors the light a bit green. I’ve got two or three bands of CD-R’s in the stack, so the exact shade of green varies a bit. I also looked at some DVD-R’s, but they are a boring white. I think I’ve got older ones that’ll color the light a bit red, but I haven’t tried. With this setup, horizontal bands over a limited vertical distance can be shown where the light passes between the disks. As a result, these bands are not colored by the CD-R’s. They are visible just under Iron Man’s left arm in “Looking for trouble”. The light also reflects between the surfaces of adjacent disks; this seems to create an odd pattern that can result in curved swirly lines that are more easily seen by a camera than eyes. 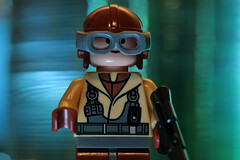 The curvy swirlies are seen in “Mom, I can see straight” to the left of the minifig. Some placements of the camera versus the CD-R stack avoid this effect and have clear horizontal lines with beveled edges as seen near the minifig in “An explorer in a strange place”. With the help of a light in front of the CD-R’s (I used an on-camera flash pointed at the ceiling and nearby wall), a single vertical column of reflected light can also be put in the background. The reflection highlights look distinctly different from the highlights of light passing through the CD-R’s. Instead of aperture shaped highlights, they have horizontal bands that seem to be sections of the aperture shape. Since this light comes from a different source, it is a simple matter to make it a different color. This shows up in “Looking for trouble” with Lego Iron Man (sans iron). I used a CTO filter on the flash attached to the camera to help make the helmet look more golden, and it shows up reflecting off the CD-R’s. What I’m most fascinated by are some horizontal bands in my picture “This guy” (lower middle of frame next to the minifig; not visible in the little thumby here, best seen after taking the link and viewing the image full size). Even though the stack is well out of focus, there are a number of thin bands. I’m guessing that the banding of horizontal disks caused similar banding in the out-of-focus light which can be made into thin lines by how the light from different bands are superimposed on each other. The top of the desk is glass, so I usually have a flash under it. The effect works a lot better than some of the scenes of the evil Kirk in “The Enemy Within”. 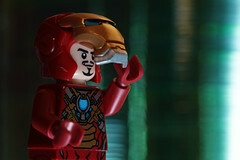 It also helped tremendously with my “Looking for trouble” picture; one flash lit the face and the other lit the helmet. I also made a video to show how the background can change, but it really doesn’t give a full demonstration.